While deeds, marriages, wills, etc., have been recorded in official records for a long time, in the United States the official recording of births and deaths was not required in most states until after 1900. Often the best place (and sometimes the only place) to find these vital statistics when you start researching your family history is on tombstones in cemeteries. That is, if the grave of the person for whom you are trying to find this information was marked, the tombstone was durable, and it still exists and is readable. Some tombstones have lasted and are still readable after centuries - but many have faded with time. Deterioration of marble stones has increased dramatically in recent decades as a result of "acid rain" - while granite tombstones have held up better. Sandstone, which seemed to be readily available and often used by some of our ancestors as tombstones, tends to weather rather rapidly and become unreadable after a few decades. The further back in time that you are searching the less likely you are to find a readable tombstone - for several reasons. One reason, of course, is the ravages of time and weathering of the stones. But depending on the economic situation, another reason was that many graves were originally unmarked, marked by a wooden marker, or marked with a common fieldstone with initials or names scratched on it. These fieldstones usually will not be readable - and seemed to be common among my more distant ancestors. 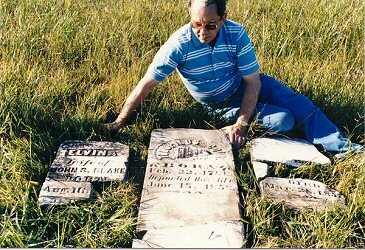 In my own research I have found much good information on tombstones - but have also run into numerous frustrations in looking for graves and tombstones. First you have to find the right cemetery - and then you have to find the right grave - and then you might have to collect the pieces of a tombstone that has been broken by vandals - or do a little digging to unearth stones that have been mostly swallowed by the ground. 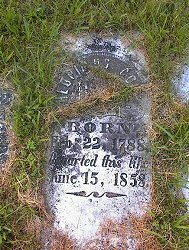 The photos above are from the New Hope Cemetery in Jefferson County, Illinois. In the first photo made in about 1990, I had just assembled the pieces that I could find from four different piles of fragments of broken stones of the tombstones for my gr.gr.gr.grandparents, Theophilus and Elizabeth (Caldwell) Cook and one of their children, Elvina Cook Blake. The second photo was made by Misty Flanigan about 10 years later when she and Cindy Ford indexed and photographed the stones in that cemetery - showing that the pieces that I had assembled were still where I left them.